Thanks to a handy Christmas present of the Javelin Boys by Steve Bond I was reminded of how much the 1950’s jets intrigued me as a teenager and of course along with many of the other jets of the period I would at some point like to build a stick and tissue Javelin, this time for Rapier power. I vaguely remember building one in my teens for a Jetex 50 without much success and more recently I built the profile Jetex Javelin for display in a museum. Sadly as I didn’t want to do any damage by test gliding, it never saw any air under its wings. What concerns me about the KK Javelin is that I remember reports and much discussion over the fact that it would ‘dive in’ either way rather than fly circuits, the DH110 model apparently behaves similarly. I even witnessed a KK Javelin powered with a Rapier exhibiting that very trait at Old Warden a few years ago, it seemed to dive in to the left or right much to the annoyance of the flyer. Speaking from experience I found that if the CG is too far forward this is often the case with some models but without building and testing a Javelin or DH110 myself I will have to reserve my opinion. It is simple to find out about a potentially tricky model by building a smaller profile model and below is the model I built from 1mm Depron. The model has approx 2 degrees of decalage and the CG is 37% of the wing root (or just behind the kink in the wing) and launched in a steep bank it flies 180 degrees right round half a circuit without diving in. Adding a small weight to simulate a Rapier opens up the radius of the turn but add enough to simulate a Jetex motor and it snaps back quickly into straight flight. The KK model has the CG at 34% and barely over 1 degree of decalage! Perhaps it was under elevated and too nose heavy all along? As an interesting side note, perhaps the low CG is the real reason why my profile Starfighter and Harrier models with their relatively heavy solid balsa anhedral wings fly perfectly normally without problems, I have often wondered how they managed it! Maybe adding some more weight under the CG is also the answer for the DH110, but having said that I did see several fine flights with a small profile DH110 at Oxford’s Port Meadows, so somebody has already cracked it. 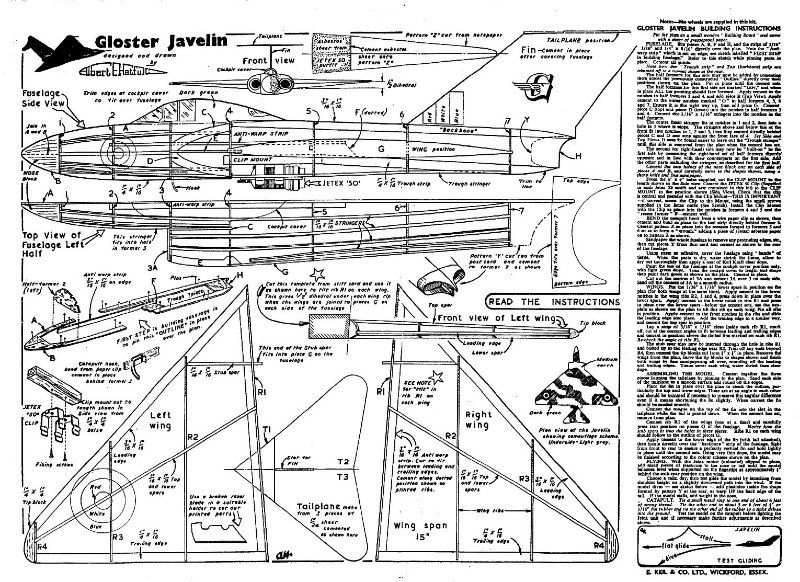 I think my next step will be to build a smaller version of the Jetex profile Javelin for L1 power in balsa and/or foam and see if my findings can be verified by banked catapult launches and then some Rapier powered flights. Watch this space but don’t hold your breath. Your results may vary of course so I would be glad to hear if anyone has flown or seen any of these 50’s jets fly well, Jetex profile Javelin, KK Javelin or KK DH110? "The shape of the Javelin is definitely distinctive and the translation into model form presented no great difficulty, but there was the question of whether to treat the aerodynamic form as a pure delta or a 'short-coupled' 'normal' layout. 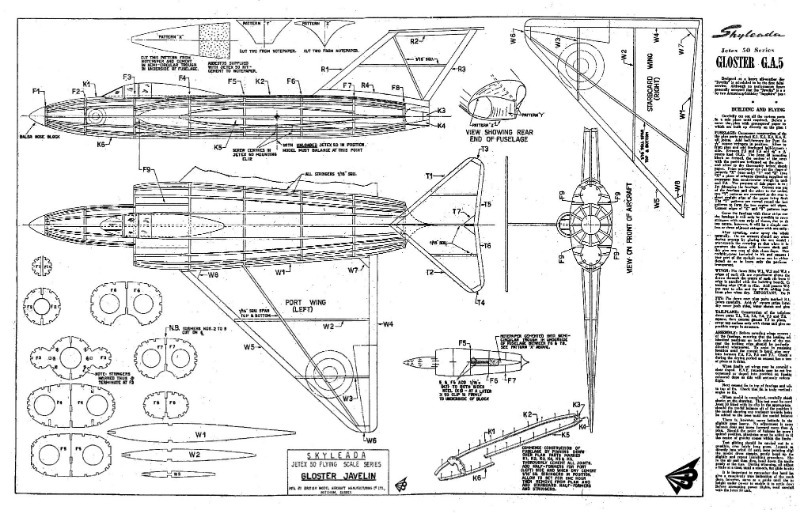 it was decided to keep the wing free from structural complications of reflex trailing edge or similar devices, and to use the tailplane to obtain a corresponding action". So the tail plane was there to do a job, i.e. 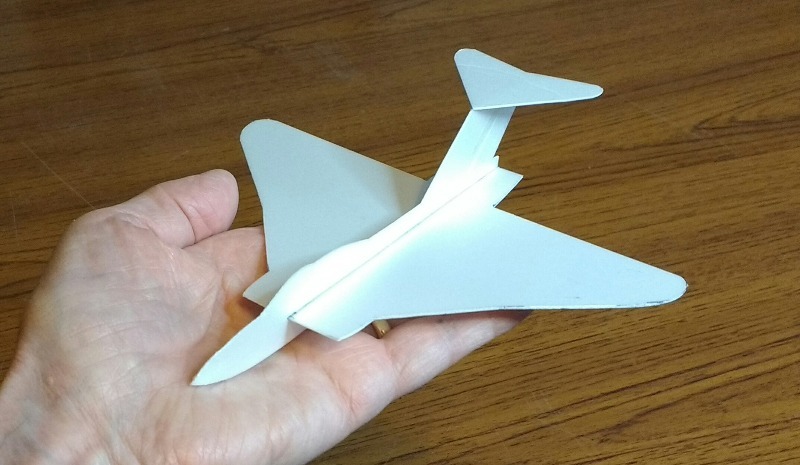 to stabilise the wing, but to do this at least two degrees (or so) is a minimum I would have thought. This has two degrees of 'decalage' and a CG at about 48%. I suspect this design might fly a lot better (predictably) than the better known KK version. Someone should tell the 'Vintage Model Company'!